Educational Qualification: SSLC with Diploma in Relevant field of Engineering / Technology and NTC in the Relevant trade of ITI course with a minimum 3 years of training experience / NAC in the Relevant trade with a minimum 3 years of training experience. Application Fee: Rs.150/- (Examination Fee Rs.100/- + Processing Fee Rs.50/-). (Demand Draft drawn in favour of Assistant Account Officer, Directorate of Employment and Training, Payable at Chennai. Rs.50/-for SC/SCA/ ST PH and Destitute Widow candidates. 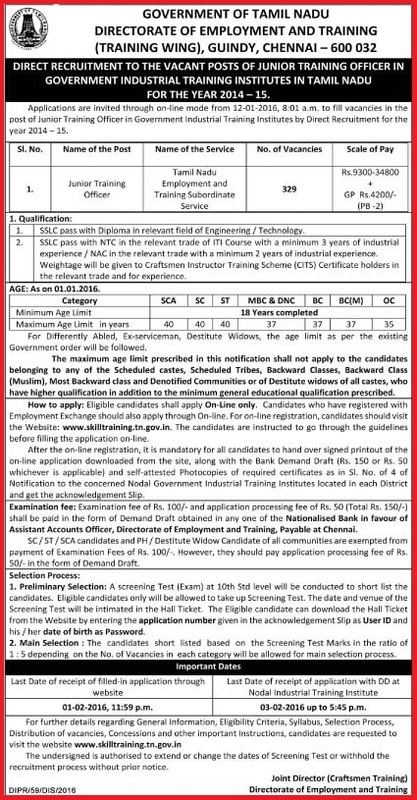 How to Apply: Interested candidates should apply through Online Only and handover the signed printout of the Online application along with self attested photocopies of all certificates to the concerned Nodal Government Industrial Training Institute located in each District and get the acknowledgement slip.